Back in the 1990's, when "inbound marketing" was once again in fashion, I was working development for a large QSR brand. Our prospective franchisees or candidates -we never referred to them as "leads"- called us on a land line. Sometimes, they would even fax us. You must imagine this: A candidate needed to meet or exceed a net worth of $1 million to qualify for our development. I had to figure out whether they would qualify - over the phone. Caller-id was no more revealing then than an email address is today. You could work for weeks with what turned out to be great candidate - except that they could not meet the financial qualifications. What I learned, quickly enough, was to use a simple method to get people to truthfully reveal whether they were qualified or not. All over the telephone, using no other source of information. I can reveal this method to you today - it still works. You ask the on the phone - "Do you have a net worth that meets or exceeds our financial requirements?" at the exact right time in the sale process - after they have raised their hands and asked to go forward. People will truthfully reveal their financial qualifications - if your sales process is thoughtful. The secret technique was waiting for, what my business partner Michael Webster calls, the Signal of Commitment. Only after I heard the right signals, could I ask for and get a truthful revelation of their financial qualifications. Contrast our ability to listen to a real human asking real questions about the business opportunity to what we ask for on websites. 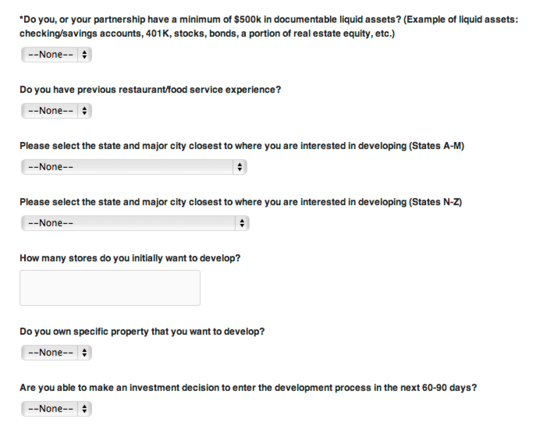 Here is a representative application to a capital intensive franchise. You have already asked the candidate whether they were qualified - using a form on the internet! How many worthless inquiries is this going to produce? Too many - but too few leads. Your application process lacks grace. You don't get the deal done with someone who is only committed to filling out a form on a website. No, the only way to do capital intensive franchising is using old fashion technology - listening, waiting the signal and then asking for the commitment.